Bethlehem (Aramaic for House of Laham, the Canaanitic God of Sustenance) area is decked in colors and the best and most beautiful lights are the smiles on the faces of our children. On Saturday evening, we attended a Christian service that was a joint service with the National Cathedral in Washington DC. The Palestinian children bell choir was uplifting. Children led the lighting of the candles at churches, the singing, and the choirs and they outnumbered adults in most activities. We were blessed by visited homes of poor children of different faiths. On Monday 3500 members of marching bands/scouts (most youth under 18) led parades near the apartheid wall separating Jerusalem from Bethlehem towards the Nativity square. Some of the marching youth were Muslims. The marching band from Gaza (Christian and Muslim) was not allowed to participate by the Israeli occupation authorities. 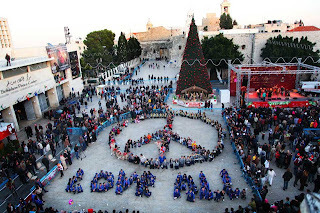 Earlier in the day, children in the square formed a large peace symbol and the words "LOVE ALL" with their bodies in front of the massive Christmas tree in the square. The United Nations Work and Relief Agency for Palestinian Refugees (UNRWA) had banners asking people to remember the suffering children in Gaza and Syria. Later in the day, the Palestinian Center for Rapprochement and the YMCA/YWCA Joint Advocacy initiative organized a children's program. Laughing and dancing lasted for nearly two hours and then gifts were passed to the kids by Santa Clause. We all should remember that Jesus was born 2000 years ago in a humble manger. My ancestors, the Shepherds of Beit Sahour recognized the message of hope and acted on it. They and Jesus were Palestinians living under a foreign imperial occupation managed by local individuals who claimed religion and law. Herod killed the Children of Bethlehem to advance the agenda of hate. Jesus advanced the agenda of love. His family became refugees from tyranny (like millions of Palestinians today). Jesus challenged military occupation with non-violent resistance and chastised Pharisees and Sadducees for hypocrisy. He called for peace and helped the oppressed. This important child of Bethlehem is recognized by Christians, Muslims, and most of humanity (including atheists and agnostics) as a great teacher and a saviour. He taught all humanity that it is important to tell the truth and stand with the weak and oppressed of this world. He taught by example. Palestinian Christians believe he became the first martyr for non-violent resistance to foreign occupation of Palestine. He said "let the children come to me" and implored us to believe in goodness in the same way that children do and then to ACT on our belief. Whether we are Christian or not, this is the message coming forth from Bethlehem this season and all the time. If you are in the Bethlehem area let us get together and plan our actions for 2013 and beyond especially for the future of all children of our shared planet. Tuesday/Today 4 PM Candle Light march for Palestine in Beit Sahour starting at the Shephetrds' Field followed by festival of Christmas with music etc. "do not ask whom for the bells (of Bethlehem) toll, they toll for thee"
We remembered the 20 children killed in Connecticut (where I last lived in the USA). We remembered them and we also remembered the 33 children killed last month by US funded Israeli war machine and the hundreds of Pakistani and Afghani children killed this year by US drone attacks. We also remembered the tens of thousands of children killed this year by hunger and disease that could have been avoided if we had our priorities correct. I just attended two conferences one indirectly dealt with children: one indirectly because it discussed environmental issues - my abstract is below) and one dedicated to serving Palestinian children (led by UNICEF). So for this Christmas, I am making a pledge to focus on needs of children in 2013 and urge you to do the same. Below are articles and also media contrtacts dealing with Christmas in the land of Jesus. Whether one is a Christian or not, the situation here calls for examination. The developments in the last few days have been interesting to say the least. Israeli papers are finally publishing stories showing that Israel assassination of the Hamas leader Jabari that began the latest attack was intentional and political. Jabari was actually considering a draft ceasefre agreement reached between a Hamas representative and an Israeli with the knowledge of Israeli defense minister Ehud Barak and the Israeli hierarchy. Perhaps that is why Barak announced quitting of political life knowing that this will come back to haunt him in the upcoming elections! But Netanyahu and Lieberman are doggedly counting on the settler vote to win and had the plans ready ahead of time. The vast majority of countries voted for accepting Palestine into the UN system as a non-member STATE (based on the 1967 borders but also with reference to UNGA resolutions 181 and 194). Only Canada, the Czech Republic & a few tiny islands dependent on US aid voted NO with Israel & US. Four days later, the United Nations voted to inspect Israel’s nuclear facilities (which had manufactured hundreds of nuclear weapons destabilizing the region). The vote also calls on Israel to join the Nuclear Nonproliferation Treaty without further delay. The vote again passed with vast majority: 174 countries votes for the inspection, six voted against, and six abstained. The countries that voted against the resolution were Israel, the United States, Canada, Palau, Micronesia, and the Marshall Islands. Shameful succumbing to Israel lobby by those very few counries (against their own people's interests). But clearly Apartheid Israel is isolated and we must increase the pressure to isolate it further to achieve peace with justice. The Israeli government arrogantly decided to continue violating International law: a) it rejected all relevant UN resolutions, b) it withheld Palestinian tax money (called stealing), c) it approved building even more colonial settlements on Palestinian lands (also called stealing), and c) it bribed and blackmailed politicians around the world (Israeli intelligence is good at getting dirt on politicians or even entrapping them) to avoid any concrete measures of punishment. While all governments objected verbally (even the USA! ), most failed to take any concrete measures against apartheid Israel for engaging in crimes against humanity. In fact, some European countries and the US are applying pressure on Mahmoud Abbas (whose term expired two years ago) not to take actions in International fora to hold Israel accountable. The Palestinian Authority is now on shaky ground and not only politically (because of the division) but economically and over 150,000 civil servants will likely not get paid this month. All this emphasized to us Palestinians that liberation must come before governance. We must depend on ourselves (with some help from civil societies around the world and few governments) and there are certain things that must be done NOW: Fatah and Hamas and other Palestinian factions must implement their reconciliation agreements and the PLO must be reconsitituted on democratic ground to represent all 12 million of us and to deal with the grave challenges ahead. History will not forgive leaders who can make and implement agreements with their colonizers (including Oslo and ceasefires) but cannot implement agreements with their fellow countrymen. It is then possible engage in large scale popular resistance that gets most of the Palestinians to Participate and on solid footing and to take Israel to the International Court of Justice for breach of conventions like the Geneva Conventions, the Hague Conventions, and most importantly The International Convention for the Suppression and Punishment of the Crime of Apartheid (see http://untreaty.un.org/cod/avl/ha/cspca/cspca.html ). Most Palestinians see that salvation will not come from outside and that unless we Palestinians are serious about challenging Israel, we will remain under perpetual occupation. There is a role for the international society and millions are now activists in the campaigns of boycotts, divestment and sanctions as we did it with Apartheid South Africa. Just last week, Stevie Wonder canceled his participation in concert that would have benefited the Israeli occupation forces (IOF). It still rings in my ears: India Zindabad!! 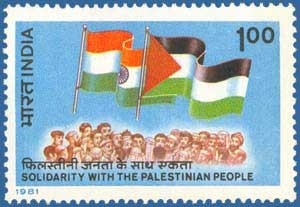 Palestine Zindabad!! Report from B'Tselem on "The E1 plan and its implications for human rights in the West Bank"